Iconic mason jar shaped salt and pepper shakers. Great for spices too. These cute shakers are a great addition to a Canadian kitchen. Designed to fit inside of a standard twin-sized sink. Durable, heavy-duty construction makes this dishpan ideal for household tasks, such as dish washing or soaking laundry. Blue. 4-1/4" x 10-1/2" x 1-3/4". Set of 2. Holds regular to jumbo paper towels. Grips towel roll firmly and dispenses easily with a steady pull. Can be mounted horizontally or vertically on any door, cabinet or wall surface. Two mounting screws are included. With red graphics. Microwave safe. Easy-to-read graphics in ounce and metric markings. Full-grip open handle stack great. Durable. Dishwasher-safe. Heat resistant up to 300-degree C / 572-degree F. Dishwasher safe. Handle made of polypropylene, do not place on source of heat. Won't scratch cookware. Nylon head, stainless steel handle. Won?t burn, melt, or stain. Heat resistant up to 204 C / 400 F. Nylon head, stainless steel handle. Won?t burn, melt, or stain. Heat resistant up to 204 C / 400 F. Provides an accurate temperature reading for crispness in deep frying or doneness in candy and jelly making. Adjustable pan clip. Cool touch yellow ball for safe handling. Protective storage case with cooking temperatures in Celsius and Fahrenheit. Waterproof. Pieced IC tin. Fluted spout; close nesting. With red graphics. Microwave safe. Easy-to-read graphics in ounce and metric markings. Full-grip open handle stack great. Durable. Dishwasher-safe. Adjustable pan clip. Easy to read 3" dial. Durable stainless steel. Dishwasher safe. Temperature range from 40-degree C to 200-degree C (100-degree F to 400-degree F). NSF. Set includes: 1/4, 1/2, 1 tsp, 1/2 and 1 tbsp. Snap fit for easy storage. Assorted colors: mauve/blue, and blue/mauve. Dishwasher safe. Pieced IC tin. Fluted spout; close nesting. Compact metric scale with large 5.5" diameter weighing tray and easy to read display. Weighs up to 500g with 10g graduations. Metric scale with large 5.5 in diameter weighing tray and easy to read display. Easy to read 3" dial. Durable stainless steel. Can be mounted hanging or standing. Temperature range from 50-degree C to 300-degree C (120-degree F to 570-degree F). NSF. Professional model with large 3", easy-to-read dial. Can be hung or stood up. Durable stainless steel. Safe temperature indicator. Temperature range from neg 20-degree C to 30-degree C (neg 30-degree F to 80-degree F). NSF. Fits standard twin or single sinks for washing dishes, soaking laundry, etc. Molded-in grips for easy portability. 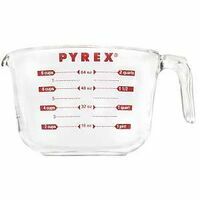 14.45 in W x 12.55 in L x 5.67 in H.
Measuring Cup, Glass, Red Graphics, Microwave Safe. With red graphics. Microwave safe. Easy-to-read graphics in ounce and metric markings. Full-grip open handle stack great. Durable. Dishwasher-safe. Pieced IC tin. Fluted spout; close nesting. Easy to read. Durable stainless steel construction. Hang or stand mounting options. Safe temperature zone indicator. Temperature range from neg 40-degree C to 20-degree C (neg 40-degree F to 60-degree F). NSF. Safe/dangerous temperature zone indicator. Multipurpose use from HVAC to laboratory, photography, automobile, household situations and food preparation. The analog dial generates accurate temperature readings from 0 to 220 degrees fahrenheit. The stainless steel probe is housed in a protective sheath and features a pocket clip for convenient portability. Temperature reading from 135 F to 185 F. Removable silicone grip prevents rolling. Ideal meat temperature guide. With red graphics. Microwave safe. Easy-to-read graphics in ounce and metric markings. Full-grip open handle stack great. Durable. Dishwasher-safe. Cushions dishes and glassware inside sink to help prevent breakage. Prevents dishes from breaking or chipping when they hit the bottom of the sink. Raised feet so sink stays clean and dry underneath. Microban antimicrobial protection inhibits growth of bacteria that can cause stains and odors. Small twin sink plastic dish drainer. Built-in Microban antimicrobial product protection fights the growth of stain and odor-causing bacteria. One piece durable plastic construction. Plate holders are angled to separate china for quick drainage. Holds up to 13 plates and 6 glasses. Two built in silverware cups. Pieced IC tin. Fluted spout; close nesting. 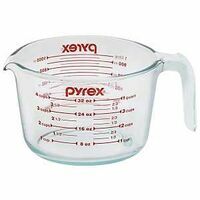 Set includes: 1/4, 1/3, 1/2, 3/4, and 1 cup. Snap fit for easy storage. Metric and imperial measurements. Dishwasher safe. Hand-held, compact slicer for vegetables. Adjustable slice thickness. Integrated pusher for added safety. Stainless steel blade. Removable parts for easy cleaning. Dishwasher safe. Assorted colours: each master case contains 2 orange, 2 blue and 2 green slicers.